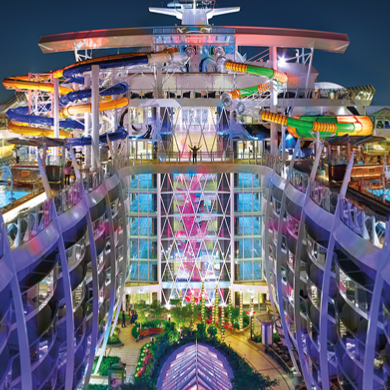 Introducing Harmony of the SeasSM, Royal Caribbean's latest addition to their family of Oasis-class ships. Bring along your sense of adventure! Enjoy the three new thrilling waterslides in the ship’s Pool and Sports Zone, as you dip, dive and swirl three decks down through a series of twists and turns. Whether it's your first time on a rock wall or you are a seasoned climber, there are challenges for all levels of experience on the signature rock climbing wall. Take a tree-lined stroll through Central Park, or find your own haven in any of the other seven iconic onboard neighbourhoods. When the ship hits the high seas, the excitement of Casino Royale® kicks off. Try your hand at the card tables, spin to win at Roulette, and hit it big time with the pull of a slot machine, or sit back, relax and enjoy a show with Broadway's hit Grease – The Musical, coming to the high seas for the first time ever. Skilled chefs twist the kaleidoscope to invent fantasy gourmet dishes, magical elixirs, and more never-before-seen fare. Chef Jamie Oliver may be one of Britain's most famous food exports, but it's his intense passion for Italian cooking and the Italian way of life that drives the menu at Jamie's Italian. From fresh and flavourful sushi to traditional Mexican dishes that dance on your tongue, there is something for everyone! Find the Aventura card that’s right for you. Earn up to 20,000 Aventura Points and a $120 travel credit - that’s up to $520 towards your next flight3! Enjoy a Priority PassTM Membership and 4 complimentary visits per year at 1,200+ airport lounges17: over $200 value3! Speed up your border crossings with NEXUS◊: We’ll cover your NEXUS Application Fee18: A $50 value3! Learn more about the CIBC Aventura Visa Infinite Card. Opens in a new window. Learn more about the CIBC Aventura Visa card & CIBC Aventura Visa Card for Students. Opens in a new window. Learn more about the CIBC U.S Dollar Aventura Gold Visa* Card. Opens in a new window. Get up to 35,000 Aventura® Points and a $120 travel credit – that’s up to $920 towards your next flight7! Learn more about the CIBC Aventura Visa* for Business. Opens in a new window. MasterCard®, World MasterCard®, and World Elite MasterCard® are registered trademarks of MasterCard International Incorporated. All other trademarks are owned by CIBC or related entities. v. A NEXUS◊ application fee valued at $50 CAD or $50 U.S.
i. A welcome bonus of 15,000 Aventura Points when you make your first purchase at any time with your card. ii. An additional bonus of 5,000 Aventura Points if you have at least $1,000 in net purchases posted to your account during the first 4 monthly statement periods. For this bonus the following do not qualify as purchases: cash advances, balance transfers, CIBC Convenience Cheques, fees, interest, Aventura Points redemptions and payments. It may take up to several business days for purchases to be posted to your account. Aventura Points are awarded to you within 8 weeks after all qualifying purchase(s) are posted to your account. Card account must be open and in good standing at the time the bonus Aventura Points are awarded. iii. A $120 travel credit. The $120 travel credit can be used in a single transaction towards flight, hotel, car rental and vacation package bookings made using your CIBC Aventura Visa Infinite or CIBC Aventura Gold Visa Card and towards taxes and fees. The $120 travel credit can also be used towards a travel booking charged to your CIBC Aventura Visa Infinite or CIBC Aventura Gold Visa Card and in conjunction with any rewards purchase or redemption of Aventura Points. If the value of your booking is less than $120, you forfeit the balance of your travel credit. Only the primary cardholder or a delegate can use the travel credit. You must call an Aventura Travel Assistant at 1-888-232-5656 to apply the travel credit; the travel credit cannot be applied or used for online bookings. The $120 travel credit offer cannot be combined with any other CIBC credit card products offering a travel credit. Your account must be in good standing at the time of booking to take advantage of the travel credit. Unused credits will expire on June 30, 2020. Offer applies to newly approved card accounts only; transfers from an existing CIBC credit card to a CIBC Aventura Visa Infinite Card or CIBC Aventura Gold Visa Card are excluded. This offer is not transferable. This offer may be withdrawn or changed without prior notice at any time. This offer may be revoked if you appear to be manipulating or abusing it, or are engaged in any suspicious or fraudulent activity, as determined by CIBC in its sole discretion. Earn 1.5 Aventura Points per dollar charged on purchases (less returns) at merchants classified in the credit card network as grocery stores, service stations or automated gas dispensers or drugstores. This bonus Aventura Points offer is only available on the first $80,000 in net annual card purchases on your account (meaning all card purchases by all cardholders, at any type of merchant); after that, net card purchases at grocery, drugstore and gas merchants will earn Aventura Points at the regular rate. The $80,000 limit will reset to zero after the day your December statement is printed. Terms, conditions and eligible merchant categories may change without notice. Aventura Points are earned on card purchases less returns, and not on cash advances, interest, fees, balance transfers, payments, regular CIBC Convenience Cheques or Aventura Points redemptions. Aventura Rewards and Program Terms may change without notice. Taxes, fees and surcharges may apply to Rewards. Aventura Points earned on purchases during a monthly statement period may not be credited to you if your card is not in good standing at any time during the monthly statement period. You must apply and be approved for a new eligible card between March 1, 2019 and June 30, 2019 to qualify for this offer. i. A welcome bonus of 20,000 Aventura Points when you make your first purchase at any time with your card. ii. An additional bonus of 15,000 Aventura Points if you have at least $3,000 in net purchases posted to your account during the first 4 monthly statement periods. For this bonus the following do not qualify as purchases: cash advances, balance transfers, CIBC Convenience Cheques, fees, interest, Aventura Points redemptions and payments. It may take up to several business days for purchases to be posted to your account. Aventura Points are awarded to you within 8 weeks after all qualifying purchase(s) are posted to your account. 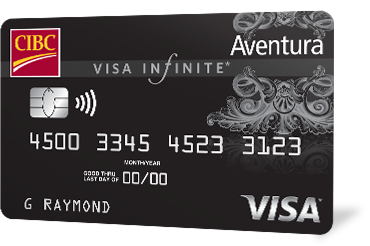 Card account must be open and in good standing at the time the bonus Aventura Points are awarded. iii. A $120 travel credit. The $120 travel credit can be used in a single transaction towards flight, hotel, car rental and vacation package bookings made using your CIBC Aventura Visa Card for Business and towards taxes and fees. The $120 travel credit can also be used towards a travel booking charged to your CIBC Aventura Visa Card for Business Plus and in conjunction with any rewards purchase or redemption of Aventura Points. If the value of your booking is less than $120, you forfeit the balance of your travel credit. Only the primary cardholder or a delegate can use the travel credit. You must call an Aventura Travel Assistant at 1-888-232-5656 to apply the travel credit; the travel credit cannot be applied or used for online bookings. The $120 travel credit offer cannot be combined with any other CIBC credit card products offering a travel credit. Your account must be in good standing at the time of booking to take advantage of the travel credit. Unused credits will expire on June 30, 2020. Offer applies to newly approved card accounts only; transfers from an existing CIBC credit card to any CIBC Aventura® Visa* Card for Business (regardless of the $120 or $180 annual fee) are excluded. This offer is not transferable. This offer may be withdrawn or changed without prior notice at any time. This offer may be revoked if you appear to be manipulating or abusing it, or are engaged in any suspicious or fraudulent activity, as determined by CIBC in its sole discretion. v. $800 value is based on the maximum redemption value for 35,000 Aventura Points on a short haul airfare purchase, based on the Aventura Airline Rewards Chart at www.cibcrewards.com, before taxes and other charges, as at March 1, 2019. Aventura Points can be redeemed for up to 100% of the cost of airfare, subject to maximum ticket price applicable to destination (see Aventura Airline Rewards Chart for more details), as well as (if you have sufficient Aventura Points) for taxes and other charges on airfare purchased through the CIBC Rewards Centre. Use of points towards taxes and fees is in addition to the number of points required for the base fare, as outlined on the Aventura Airline Rewards Chart. You must book all flights through the CIBC Rewards Centre. Some taxes and other charges may be collected locally or when you are travelling, and cannot be prepaid; please ask a CIBC Rewards Centre Counsellor for details. You are eligible for the additional spend based bonus of 2,500 Aventura points if you are not a current CIBC cardholder. If you are a current CIBC cardholder, we may approve your application but you will not be eligible for the additional spend based bonus of 2,500 Aventura points. ii. An additional bonus of 2,500 Aventura Points for the CIBC Aventura Visa Card, if you have at least $500 in net purchases posted to your account during the first 4 monthly statement periods. For this bonus the following do not qualify as purchases: cash advances, balance transfers, CIBC Convenience Cheques, fees, interest, Aventura Points redemptions and payments. It may take up to several business days for purchases to be posted to your account. Aventura Points are awarded to you within 8 weeks after all qualifying purchase(s) are posted to your account. 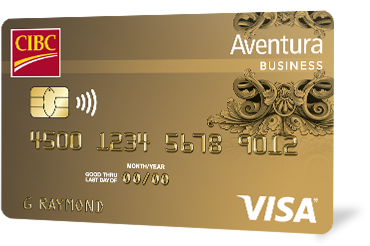 Card account must be open and in good standing at the time the Aventura Points are awarded. Offer applies to newly approved card accounts only; transfers from an existing CIBC credit card to a CIBC Aventura Visa Card are excluded. This offer is not transferable. This offer may be withdrawn or changed without prior notice at any time. This offer may be revoked if you appear to be manipulating or abusing it, or are engaged in any suspicious or fraudulent activity, as determined by CIBC in its sole discretion. Tous les achats effectués à l’extérieur des États-Unis sont aussi portés à votre compte en dollars US et apparaissent sur votre relevé dans cette devise. Des frais de conversion de devises s’appliqueront à tous les achats qui n’ont pas été effectués en dollars US. ii. 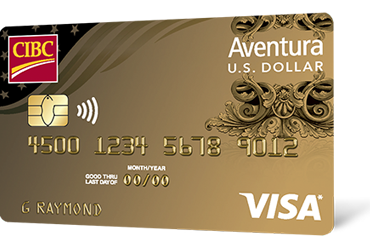 An additional bonus of 2,500 Aventura Points for the U.S. Dollar Aventura Gold Visa Card, if you have at least $500 in net purchases posted to your account during the first 4 monthly statement periods. For this bonus the following do not qualify as purchases: cash advances, balance transfers, CIBC Convenience Cheques, fees, interest, Aventura Points redemptions and payments. It may take up to several business days for purchases to be posted to your account. Aventura Points are awarded to you within 8 weeks after all qualifying purchase(s) are posted to your account. 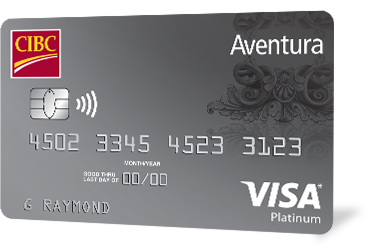 Card account must be open and in good standing at the time the Aventura Points are awarded. Offer applies to newly approved card accounts only; transfers from an existing CIBC credit card to a CIBC U.S. Dollar Aventura Gold Visa Card are excluded. This offer is not transferable. This offer may be withdrawn or changed without prior notice at any time. This offer may be revoked if you appear to be manipulating or abusing it, or are engaged in any suspicious or fraudulent activity, as determined by CIBC in its sole discretion. Priority PassTM benefit is for the primary cardholder only and requires enrollment. For instructions, visit CIBCRewards.com/perks. Collinson is the administrator of the Priority Pass program. Four (4) lounge visits are complimentary per membership year for you to use for yourself or your accompanying guests. Each person entering the lounge will qualify as one visit. Member and any accompanying guest(s) apply against the complimentary visit allowance. Membership includes access to any airport lounge participating in the Priority Pass lounge program. To access a lounge, you must show a valid Priority Pass membership card. All additional visits beyond the complimentary visit allowance are subject to a fee of $27 U.S. per person per visit, and all card rates and fees, including foreign exchange rates and fees, apply to this purchase. This price is subject to change. The most recent price, participating airport lounges, facilities, open times, and restrictions can be found at PriorityPass.com. Applicable lounge visit fees will be billed to your related CIBC Aventura card. Unless cancelled, Priority Pass membership automatically renews on its anniversary date. Priority Pass membership will be cancelled if your CIBC Aventura card is cancelled or no longer in good standing or is no longer linked to your Priority Pass membership. All Priority Pass members must abide by the Priority Pass Conditions of Use, which can be viewed at prioritypass.com/conditions-of-use. The Airport Lounge Access services are provided by Priority Pass and neither CIBC nor Visa nor Mastercard are responsible for any losses, claims or damages arising from use of the services. Receive one (1) statement credit up to a maximum value of $100 CAD when NEXUS application fee is charged to an eligible card, regardless of NEXUS application approval. Limit one (1) statement credit every 4 years. You must use your eligible card to pay the NEXUS application fee. In order to be eligible for the statement credit, cardholders must be in good standing at the time the application fee is charged. CIBC has no control over the NEXUS program including, but not limited to, application approval process, enrollment, or fees charged. NEXUS eligibility requirements are determined by the Canada Border Service Agency (CBSA) and the U.S. Customs and Border Protection (US CBP), and can be found at https://www.cbsa-asfc.gc.ca/prog/nexus/term-eng.html. ◊ Official mark and/or trademark of Her Majesty the Queen in Right of Canada, used under licence.